True blue Denim never goes out style. Right since Levi Strauss invented and marketed this rough and tough garment, it has always been in fashion. Trends come and go, but the charm of denim never ceases to wear out. Made from the sturdy cotton twill textile, denim is the fabric that makes jeans. Denim comes in various forms, styles and colours. One can find blue, black, or grey denim in sand washed, acid washed or stone washed styles. There are probably several more washes available these days. Gone are the times when denim could be afforded and accessed by only some sections of the society. Now, it is very common. One can find them along the streets, at discount exhibitions and of course at high end malls and boutiques. Most commonly used form of denim is a trouser. 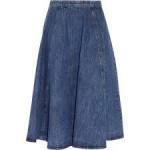 It i largely popularized as the ‘Jeans’ pant. Depending on the shape and height of the person, one can choose the correct fit. A slimmer body can do well with a jegging form. It is a legging made form denim fabric. The taller and balanced shape can do well with the regular form. Those falling short of long legs can create an illusion of length by wearing bootcut pants. For a comfortable feel, one can opt for soft denim palazzos. It is usually not a best idea to team the denim pant with a denim shirt. If you really want to do it, choose contrasting colours. A dark blue denim trouser with lighter fadedblue shirt makes a better combination or vice-versa. Wearing a white shirt with blue denim is a classic fashion statement. You can never go wrong with it. One can create a winning look if figure suited denims are worn. For a feminine look, skirts and dresses are a better option. 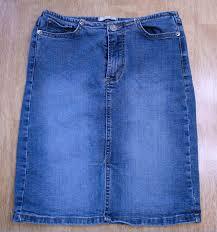 Denim skirts come in two basic forms. One is the pencil skirt that is also short. This skirt fits snugly and can get uncomfortable during the daily hustle-bustle. It is best used for leisure travel or short distance commuting. It is best worn with loose tops. Another type would be an A-line skirt with hems falling below calves. This skirt is comfortable and versatile. It can be worn as a formal garment for work and also as a casual garment. Printed tops and those in solid colors complement the denim skirt well. Fitted tops can work very well with these skirts. One-piece denim attire also makes an attractive choice as long as it is fitted. Denim jumpsuits are also a preferred choice of garment particularly among college goers. While talking a bout clothes, it is tough not to think about accessories. Think ‘denim’ and one gets ideas about wallets, pouches, sling bags, purses, totes and several other types of hand accessories. The variety is endless. Earrings, headbands and neck cuffs are some of the accessories that can gain popularity among the teenagers. Last but not the least; one can see denim usage in footwear, too. Whether it is closed shoes, open toes, sandals or gladiators –denim scraps have the ability to make the footwear trendy. Denim has the capability to adorn a body from head to toe. The fabric will continue to lure man for ages to come. Hey there! I’ve been following your site for some time now and finally got the bravery to go ahead and give you a shout out from Huffman Texas! Thank you. No idea about the browser compatibility. Thanks for your appreciation. Didn’t get the second half of your comment. I don’t even know how I finished up right here, however I assumed this submit used to be great. Thank you Marcelo Canela. I am not well-known. Writing here as a part of interest.